Following an LDS mission to Argentina, Doman saw limited snaps his first two years at BYU but saw action in five games his junior year. That season he completed 51-of-92 passes for 782 yards and two touchdowns, against four interceptions. He then had a breakout year as a senior, completing 261-of-408 passes for 3,542 yards and 33 touchdowns, with eight interceptions. The “Domanator” also rushed for 503 yards and eight touchdowns. He ended the season as an unanimous All-Mountain West Conference selection and as a Heisman Trophy candidate. Doman was drafted in the fifth round (no. 163 overall) of the 2002 NFL draft by the San Francisco 49ers. He played three seasons in the NFL with San Francisco, Buffalo, and Washington. In the first preseason game of 2004 he threw for 34 yards on 5-of-9 passing. 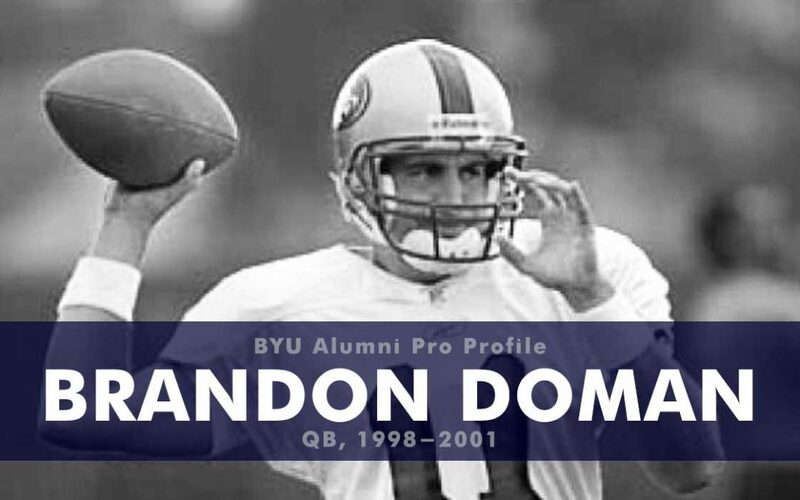 Since retiring from playing football Doman has spent some time on the Cougar sideline as the quarterbacks coach (2005-10) and the offensive coordinator (2011-13). He has also founded or co-founded a bunch of small business ventures and is currently the founder and owner of Homesports, Landecor, and Weigh Safe LLC.